Sweet Manila clams are just one component of the bountiful bento box. Knowledgeable, helpful servers can lead diners through the menu, explaining ingredients and techniques. A seat at the bar provides the best view of Miyakes creativity at work. 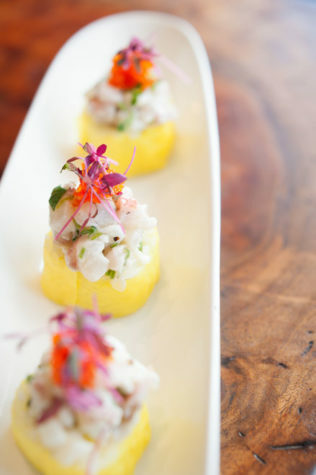 The unorthodox ceviche roll packs layers of bright, fresh flavor. Traditional Japanese cuisine is the starting point for a culinary adventure. Chef Masa Miyake is a man of few words. At first, it’s hard to understand why. He has two locally popular, nationally recognized restaurants in Portland. He has a farm where he breeds heritage pigs for use in those eateries. He studied French and Italian cooking in Japan. He has been a nominee, twice, for the Best Chef in the Northeast Award by the James Beard Foundation. The man clearly has a story to tell. But, as I discovered in the course of multiple trips to Miyake on Fore Street, he lets the food do the talking. 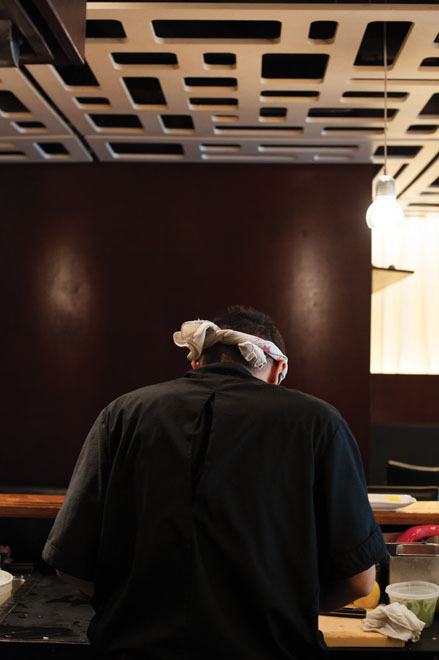 The food at Miyake is based on the practice of washoku, the traditional dietary culture of Japan. Seasonal, locally sourced ingredients such as vegetables, edible wild plants, and fish are the building blocks of washoku. They’re prepared with uncompromising attention to bring out their inherent natural flavors. Washoku is as important to Japanese culture as any shrine or historical monument. In fact, washoku has even been included on UNESCOs Intangible Cultural Heritage list, a designation that safeguards the heritage and future of the concept. For centuries, the Japanese have used their natural resources sustainably and with reverence. They look to the sea and mountains, just as many Maine restaurants do today. Masa Miyake is an excellent translator of washoku into a Maine dialect. He refers to it enthusiastically, and with gentle insistence from general manager Courtney Packer, as new-style washoku because he puts his own twist on tradition, bringing in his own personality and influences. Those influences include training in classic French cuisine, the years he owned an Italian eatery in Tokyo, and time spent in New York working at a variety of restaurants. ”We want to show customers that we are not only sushi,” he says. ”We eat with the season, from the farm and the waters.” Uni, or sea urchin, served in its whole shell, is a delicacy available only during the fall and winter seasons when Maine divers retrieve them from icy waters. And, of course, crab, scallops, and lobster are all offered in delicious unions of Maine ingredients with Japanese technique and flavor. The Miyake lobster roll is unlike any other youll find on our coast. Sushi rice holds broiled lobster tail meat with a kick of kewpie mayonnaise. Piled atop is orange tobiko roe, a sprinkle of togarashi (Japanese spice mix), and microgreens. It’s a delightful play on the iconic lobster roll of Maine. 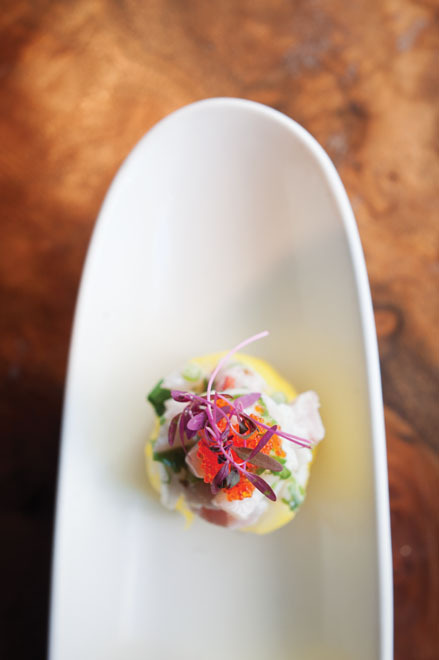 Masa Miyake refuses to use the word fusion, but in a dish such as the ceviche roll, the merging of culinary cultures is clear. The fish is from Japan, the technique from South America, and the truffle oil brings a bit of Italian flair. It’s rolled in yellow soy paper instead of the traditional nori, presented as a bright, bold bite in a sushi- roll disguise. Right now, about 25 percent of the seafood at Miyake comes from local waters, but the chef would like to see that proportion increase. Miyake is currently working with the Gulf of Maine Research Institute, exploring ways to help more local fishermen adapt to the needs of his restaurant and the types of fish served there. Until then, the sushi-grade fish that Miyake prefers, such as hamachi (yellowtail), suzuki (sea bass), and tai (snapper), mostly comes from Japan. In a bowl of sashimi, called chirashi, these fish and others are presented like a gleaming bouquet, each piece glistening and translucent over sushi rice, garnished with shredded daikon and tobiko. Some slices are mild, and benefit from being lightly dipped in tamari and a dab of spicy wasabi by the diner. Others, like the meaty bluefin tuna and iwana, a cherrywood-smoked arctic char, are best enjoyed in their purest state, unadorned. Another vital component of washoku is artful presentation. It is true that we first eat with our eyes, taking in the colors and composition of the plate set in front of us. Nowhere is this more evident than in the bento box offered at lunch. 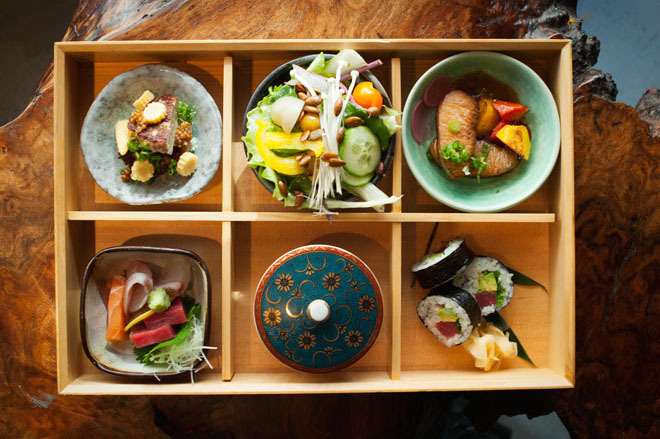 A veritable buffet, almost the width of the table, the bento box is a feast for the eyes and the palate. The six compartments of the wooden box hold six different items, like a greatest-hits compilation. Sashimi and sushi rolls are expected, but smoked and cured swordfish? It’s brilliant, moist, and lightly salty. Tiny Manila clams come steamed in dashi in a tiny covered dish. Its both adorable and delectable. Every component of the box is well thought out, and completely wonderful on its own. But together, the parts make up a perfectly balanced lunch in flavor and aesthetic harmony. A seat at the bar is an excellent spot to take in the action in the open kitchen. The work area is set up in the French style with individual stations for various jobs grilling, frying, and sautéing. Masa Miyake stands to the side with a neta box in front of him, the traditional setup for preparing sushi and sashimi. He tells me that in many high-end restaurants in Japan there is no glass case to display the fish, as is familiar in American sushi restaurants. 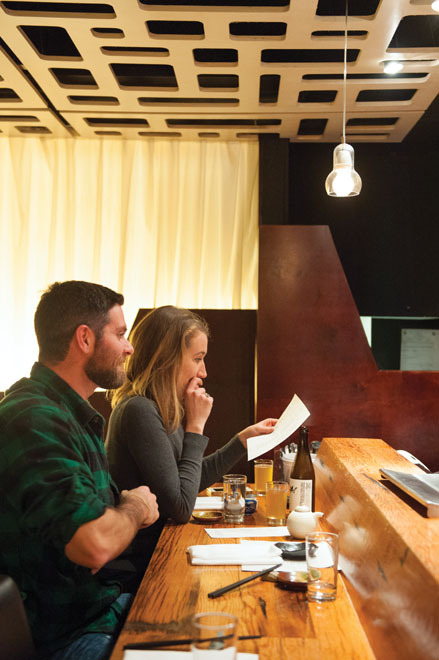 The lack of one here is a reminder that Miyake is much more than a sushi spot. I watch the kitchen staff, five young cooks, put out dish after dish requiring many components and skills. They are working on an omakase, the chefs tasting menu. Its a team effort, with each member taking a turn at one of the seven or eight dishes that comprise the menu. Asa Arden is using a brûlée torch on mascarpone and enoki mushrooms. 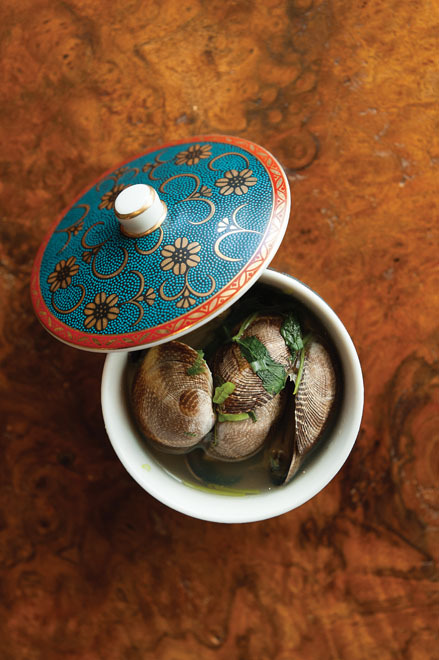 Zach Conway sautés clams in sake and dashi that will then be presented in a small iron teapot, along with a cup for sipping the broth when the clams have all been eaten. Kirby Sholl is plating an oyster atop a snowy mound of salt and garnishing it with cider-braised fennel and fresh apple blossom. With so much care and attention, each plate is truly a work of art, stunning to look at, and surprising in flavor. Each dish comes to the table in succession, paced luxuriously so that it can be admired for all its attributes. 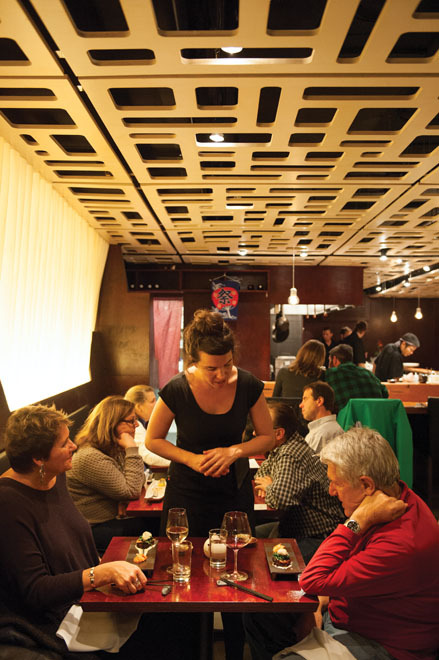 People have been known to plan their vacations to Maine around the Miyake omakase, making reservations well in advance. One person who has made the trip to Japan with Miyake is sake sommelier Stephanie Goodrich. The two spent time in a fourteenth-generation sake brewery in Kyoto and learned the process firsthand. Goodrich earned certification after two days of intense testing. She’s happy to help those unfamiliar with the rice wine. “I encourage people to ask questions and I’ll ask them questions, too. It can be intimidating, but I get excited when diners acquire an appreciation for sake.” She has put together a list of sakes with a wide range of flavors and finishes: creamy and balanced, light-bodied and dry, highly polished and elegant. Miyake encourages the entire staff to learn more about the most popular drink at the restaurant, and they have all become sake advisors. Tastes are offered and compared, so each diner can make the best decision for his or her meal. 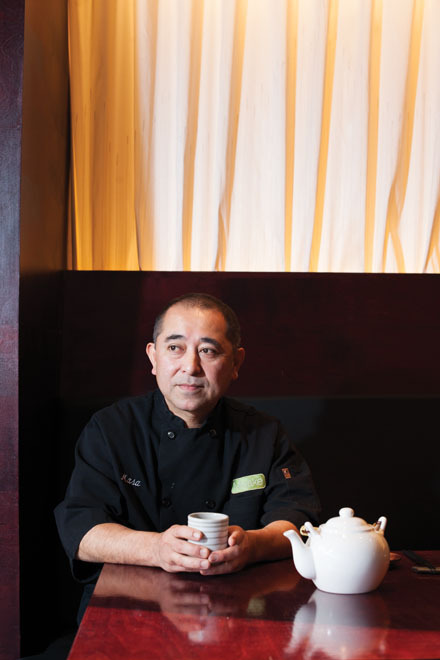 Masa Miyake and his staff assure a personal experience in every aspect, every day. It’s pervasive in the attitude, the greeting at the door, the invitation to explore the menu, the preparation of each gorgeous plate. Sushi is only the beginning. Masa Miyake tells his story through food, incorporating French and Italian influences with traditional Japanese cuisine. The chef works out dishes for the multi- course omakase, the tasting menu that best showcases his talent. 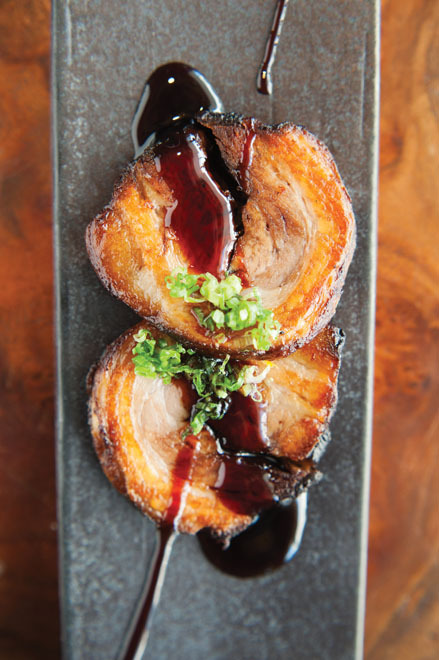 Yaki buta, extraordinarily tender pork belly, has a crisp sear and sweet soy glaze.